We love eating healthy food but sometimes its confusing what is good for you. We have lots of people asking us why our bars are healthy when they conatin fruit, which is the only thing we add to sweeten our bars. It is hard to pick up a magazine, listen to the radio or turn on the TV without hearing about what we should and shouldn’t be eating. The sheer volume of information available is incredible; and as a working mum with two boys its difficult to know what advice to follow when it comes to what foods are healthy and unhealthy. To be honest we find it completely overwhelming. The debate regarding refined v’s natural sugars is ongoing. We are working mums at Get Fruity and this subject is very relevant when providing healthy balanced food for our families. 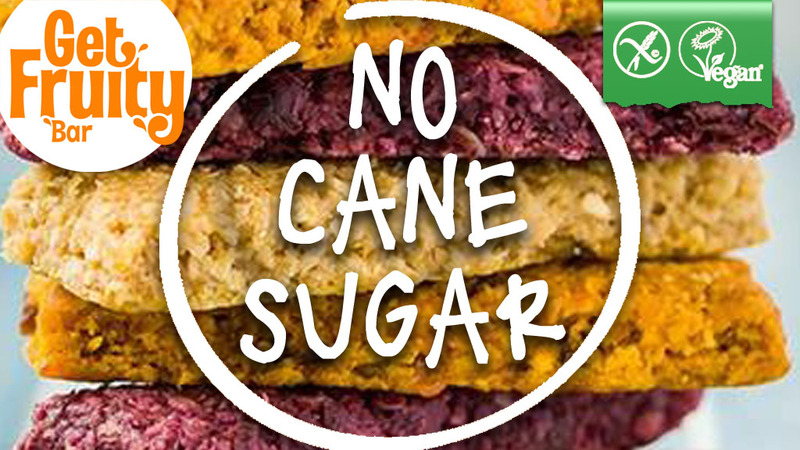 Our delicious vegan fruit and oat bars have no added refined sugar; all the sweetness in them is derived from the fruit and juices that make the bars seriously fruity. There are people who feel that the naturally occurring sugar is the same as refined sugars that come from cane sugars. Which is better, orange juice or fizzy orange juice? Would you happily give your family fruit bars with naturally occurring sugars over a chocolate bar? As a mum I allow my boys limitless fruit and vegetable snacks, is this the wrong choice to make for their health? Overwhelming!! Sugar goes through an extraction and purification process, often turning the sugar into crystals that are easy to add to food. During the refining process the nutrients that are naturally available in the raw product are lost and refined sugar is merely a calorie source. These are a type of carbohydrate, and each tiny gram offers 4 calories of energy. Carbohydrates provide fuel for our body’s processes, including the really important bits like our brain and nervous system. Carbohydrates are broken down into glucose, or blood sugar, by our bodies. Simple carbohydrates are very quickly broken down by our bodies and create spikes in our blood sugar, unlike complex carbohydrates, which take longer to process. MedlinePlus states that people should receive between 40 to 60 percent of their daily calories from carbohydrates, ideally from complex carbohydrates and some natural sugars. It seems that how our bodies break down the sugars is really important. I think it’s also really important to bear in mind that when sugars are naturally occurring in, for example, fruit, they are surrounded by other lovely little vitamins, antioxidants and fibre too. Having all this added loveliness aids our bodies to absorb fructose. However, if our bodies get overloaded with fruit sugars from, for example fruit juice, then our livers can’t use it and it gets stored as fat (this really does feel like a mine-field!!!). Sugar also contains glucose that our bodies love and can digest with ease. Too much glucose though and our blood sugar levels are effected. Eating a lot of sweets or sugar can make our body send out a distress signal and our pancreas can overproduce insulin, causing low blood sugar level! We call this a ‘sugar slump’ in our house (you see, a healthy-ISH lifestyle!!!). You need to ensure your glucose level isn’t too low either though, your body needs enough to function at its best! Aaaahhhhh! Although this doesn’t include sugar found in fruit and vegetables in their raw form, it does include smoothies, unsweetened fruit and veg juices and nectars. I was surprised to find these were included if I am honest as I would count these as natural sugars, but according to the NHS these do need to be considered in our daily intake. I feel like I could write about this subject for pages and pages, the information available feels endless. Personally I got very excited when they introduced the sugar-tax on fizzy drinks, this felt like a positive step to help reduce obesity, especially in children. As a mum I don’t allow my two to have fizzy drinks except on extremely special occasions. This is a personal choice, as is allowing them to eat as much fruit and vegetable snacks as they desire (this choice has had a detrimental effect on their teeth however!). I would also always lean towards a fruit snack bar rather than a bar of chocolate even if the sugar content is similar, knowing that a fruit snack bar has naturally occurring sugars. These were my choices before working for Get Fruity, and seeing the amazing ingredients that are put into our bars has only imbedded these choices into my little family. In my opinion the most important thing is to educate, from a really young age, on healthy eating and living. It’s about balance and being outside and active as much as our crazy lives allow us to be. For my family it’s about cooking from scratch as often as possible and all together, explaining ingredients and getting the boys involved in their food. As a mum all I can do is help my children make the right lifestyle choices and hope that they do. This doesn’t stop us having indulgent pizza nights or sweets until we pop at Halloween.